The Transformers III - Megatron 1 oz. Silver Proof Coin rounds out the Transformers III Silver Trio Series from the Perth Mint of Australia. It joins the Optimus Prime Silver Proof Coin and the Bumblebee Silver Proof Coin already discussed here on World Mint Coins. The three new strikes are issued in conjunction with the upcoming summer movie release Transformers: Dark of the Moon due to open in theaters in the United States on June 29, 2011. The likely hit movie is the third in a trilogy that started in 2007 with one simply titled Transformers with the second appearing in 2009 called Transformers: Revenge of the Fallen. 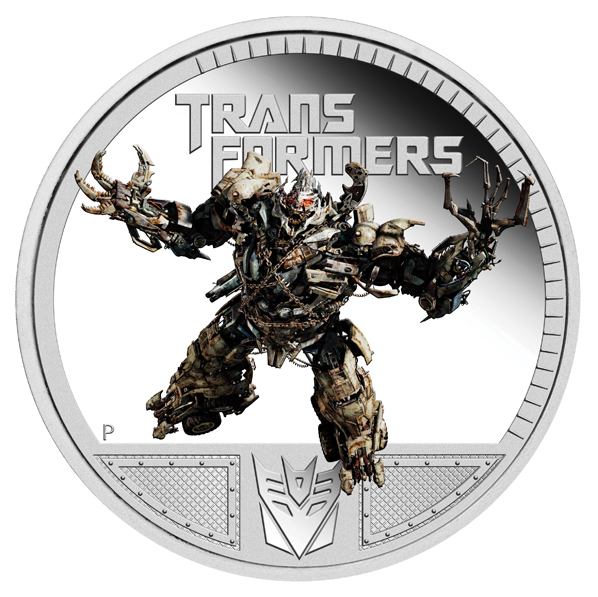 In fact, that second Revenge of the Fallen movie marked the Perth Mint's first Transformers related releases when it issued two strikes - an Optimus Prime Coin and a Megatron Coin. Both were extremely popular with collectors and movie enthusiasts and sold out in short order. Realizing how popular those first two strikes were, the Perth opted to create three for this new movie. Two again featuring the main fictional characters of Optimus Prime and Megatron as well as an additional coin showcasing Bumblebee. Each is struck from one ounce of 99.9 pure silver with a colorful reverse design of the fictional Transformers character. The obverse shows a portrait of Queen Elizabeth II as each is considered legal tender of the country of Tuvalu with a face value of one dollar from that country. "Long ago, Megatron was admired as one of Cybertron’s greatest champions, but over time, intense pride corrupted him. Using his unmatched power and rage, Megatron rules the Decepticons with an iron fist. He will do anything in his power to destroy Optimus Prime and the Autobots and claim the Universe for himself." The Perth is also offering all three of the 2011 Transformers Coins together in a trio for AUS $271.82. This is an approximate savings of 13% versus buying the strikes separately. Transformers Megatron Silver Collectible Coin Available – For Now!